Wednesday 1 March marks the tenth annual International Wheelchair Day. The international day is a platform to celebrate the positive impact a wheelchair can make in someone’s life. Over the past two years, we’ve spoken to some of our Novita kids and teens, and their families, about how having a wheelchair has changed their lives. My name is Jasmine and I have been in a wheelchair since the age of four. Being in a wheelchair has made me more independent because I can drive myself around and don’t have to rely on others to move me as much. My dream is to become an author in the future and having a disability will not stop me. My name is Ethan and I have cerebral palsy. I have been using a wheelchair all of my life; I started off in a manual wheelchair which my mum and dad had to push everywhere. When I was about ten years old, I started to use a power wheelchair. I learnt to drive myself and this had a monumental impact on my life, because I can now go wherever I want whenever I need rather than waiting for someone to push me. This is very important at school as I can drive to all my lessons independently. My name is Jesse and I have been in a manual wheelchair all my life. I am trialling electric wheelchairs at the moment. Having a chair lets me join in with my friends. I hope to get my own electric wheelchair soon and be able to be independent in it so I can go where I like. My name is Joshua and I have had my powered wheelchair for over a year now. I have Athrogryposis, a condition that I was born with. I have worn KAFOs to be able to walk around for short distances since I was about five. I use a manual wheelchair to go to distant places. When I started high school, my subjects were in different classrooms, and the school is big and wide. Hence, through the joint effort of the school’s coordinator for students with special needs and my OT and Physio from Novita, I was given a powered wheelchair. Life is so much better. I’m able to go to many places without getting my wheelchair pushed by someone. I’m able to do a lot of things like go to the park nearby on my own or with my little brother, go to shops, not needing my mum to push me, explore the perimeter of a soccer/football oval, shift from one classroom to another on time, catch up with my friends in school, access the toilet on my own and come back to classroom on time and much more. Most importantly, I have the “feeling of freedom” whenever I’m in my vehicle. In 2016, we spoke with the Mums of two young kids that were in the early stages of learning to use a manual wheelchair. Over the few short months James has had his wheelchair we have seen such a big change is his confidence and independence. He is loving his newfound freedom and being at eye level with his peers. His ability to learn and adapt to this new piece of equipment amazes us everyday. As he grows we hope he will continue to gain independence and strength. His wheelchair has opened up a whole world of opportunities for him. Maddison was introduced to her first wheelchair in December of 2012 whilst still in hospital recovering from several fractures. As her mother, I was feeling very emotional, as a wheelchair was all very new and raw to me. These feelings soon changed, as a friend of ours, whose daughter also uses a wheelchair, carefully lifted Maddison from her hospital bed and lowered her into the wheelchair. Maddison was wheeled around the ward and could now see all the beautiful Christmas decorations and lights. Her face lit up at the wonderful sight and she squealed with excitement. From that moment on, I knew her wheelchair was going to give her independence. Today, there is no stopping Maddison when she is in her chair. She loves the freedom it gives her. She dances in her chair twirling her arms around whilst spinning her wheels. At school, she loves to play musical statutes with her peers and has participated in adaptive relay teams. 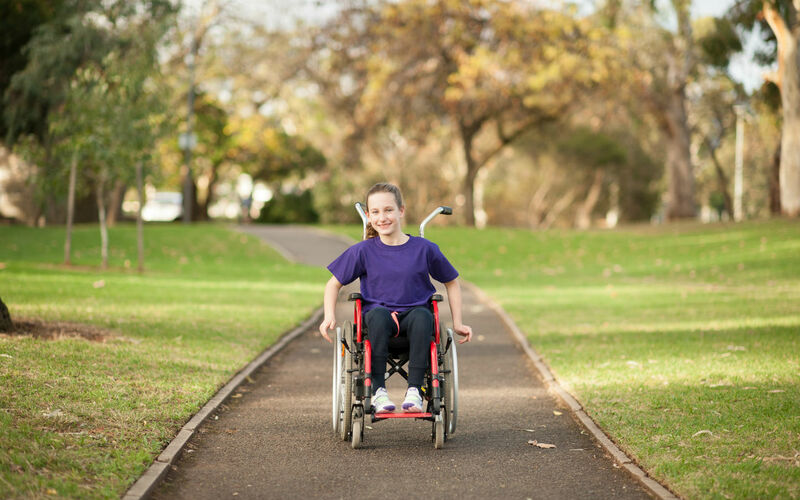 Being introduced to her wheelchair at a very young age, and in such a positive manner, has given her the confidence to be as physically independent and included in society as any other child her age.